A giant waterslide, like the one pictured, was supposed to come to Philadelphia in August. A section of Fairmount Park will be transformed into a water park on Saturday, Aug. 6, thanks to Slide the City. 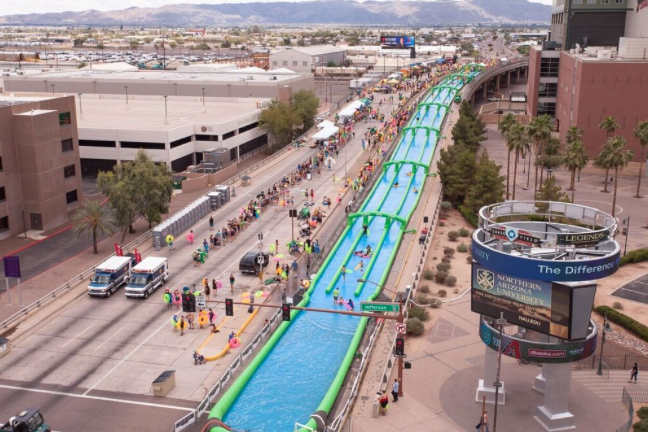 The organization brought giant water slides to various locations across the United States last year and will finally make a stop in Philly this summer with a thousand-foot water slide. The event was canceled last year. Families are invited to coast down the equivalent of three city blocks on inner tubes. Along with the one-of-a-kind slide, the event includes a block party with food, music, local vendors and street entertainers. Online registration for the event, according to the press release, opens Wednesday, May 18 at Slide the City. All those older than 5 and 46 inches tall are welcome to slide. Attendees can choose between different package options, including a triple slider, single slider, ultimate slider and all-day slider. Prices start at $10. Tickets include an entry wristband, a drawstring bag and a mouthguard.